Kashmir is open once again to the world! This is the only tour you will find which combines visits to the Golden temple, Dharamshala, Dal Lake and Little Tibet. The four doors to get into the Harmandir Sahib or Golden Temple symbolize the openness of the Sikhs towards all people and religions and that belief can be said to be at the heart of this tour. Stay on a houseboat on Dal Lake. Enjoy a Shikara ride. Explore sacred villages around Srinagar. Discover Takthok Monastery and participate in a magical Tse Chu. 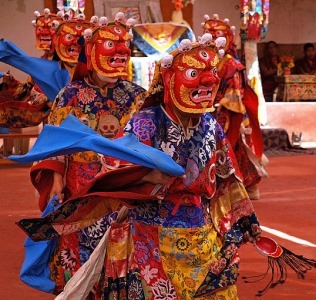 See the colorful Cham or masked dances which tell the stories of good conquering evil. Takthok Festival is your chance to open your heart and explore parts of India not on other ordinary tour itineraries. Arrive Delhi by flight. On arrival transfer to hotel. Delhi, the Empress of Indian cities has a fascinating history and a stimulating present. She has often been sacked and left naked and desolate. Despite this she is still the metropolis of a great empire. The capital of India, Delhi has been the seat of power of a number of dynasties – the Rajputs, the Afghans, the Turks and the Mughals who continued their imperial line until the British. Scattered over are surviving ruins, remnants of mighty edifices and tombs of warriors and saints – all of which are memorials not of a single city but of supplanted nations. After breakfast combined sightseeing tour of Old and New Delhi. Proceed for half day combined city tour of Old and New Delhi. Drive past the Red Fort, built in 1648 by Mughal Emperor Shahjehan; Jama Masjid, one of the largest mosques in India; Raj Ghat and Shanti Vana, the cremation sites of Mahatma Gandhi and Jawaharlal Nehru. Also drive past Chandni Chowk shopping centre; visit Qutab Minar built by Qutab-ud-din- Aibek in 1199; India Gate (War memorial arch); and Lakshminarayan Temple – a modern Hindu temple. Also drive past President’s House, Parliament House and Government Secretariat Buildings. Overnight at hotel. Early morning transfer to the railway station to board the Shatabdi Express at 0720 / 1330 hrs for Amritsar. On arrival transfer to the hotel. In the afternoon take a city tour of Amritsar to visit the Golden Temple & Jalianwala Bagh. Golden Temple: Also called Sri Harmandir Sahib, the Golden Temple was laid by Guru Ram Das in the 14th century. It is acclaimed as one of the holiest sites of the Sikhs. It has four doorways and gorgeously decorated arches. Reflecting influences of both Hindu and Muslim styles of architecture, the temple standing in the middle of a tank, exudes tremendous architectural brilliance. Although principally a pilgrimage spot for the Sikhs, it is visited by people of all religions and proves to be one of the greatest tourist attractions in Amritsar. Jalianwala Bagh: Sited near the Golden Temple, it bears testimony to the disaster called Jallianwala Bagh Massacre at the time of the rule of the British Raj. A congregation, attended by several Punjabis on the occasion of Baisakhi (New Year) celebrations on 13 April 1919 was set on fire by General Dyer. Overnight at hotel. After breakfast depart Amritsar for Dharamshala. Upon arrival check in at hotel. Dharamshala – the land of awesome peaks, of Tibetan monasteries and of meandering streams cascading down the majestic Dhauladhar range. In the afternoon visit McLeodganj. Originally the home of the semi-nomadic Gaddi tribe, McLeodganj is today the residence of His Holiness, the Dalai Lama. This mid 19th century place was developed as a British Garrison. The place was developed as an important administrative point for the whole Kangra Valley. Today the place has developed as the headquarters of the exiled Tibetan Government. The impressive monastery has larger than life size images of Buddha, Padmasambhava and Avaloketeshwara. Overnight at hotel. After breakfast leave Dharamshala for Jammu. On arrival check in at hotel. Afternoon sightseeing tour of Jammu. Jammu, nestling in the foothills of the Himalayas, with the river Tawi flowing alongside, is the place that Raja Jambu Lochan discovered one day while he was on a hunting trip. Legend has it that he came upon a clearing where he saw a sight that left him wonderstruck. A tiger and a goat stood side-by-side, drinking water from the same place in the Tawi River. He was so amazed by this unusual sight that he decided to build a city on this land where no living creature seemed to bear enmity towards each other. Little is known of Jammu’s subsequent history until, in 1730 AD, it came under the rule of the Dogra king, Raja Dhruv Deva. The Dogra rulers moved their capital to the present site and Jammu became an important centre of art and culture, especially the Pahari School of Paintings. Today, as if in testimony to Raja Jambu Lochan’s vision, the city of Jammu has come to be known as the ‘City Of Temples’. Innumerable temples and shrines, with glittering ‘shikara’ soaring into the sky, dot the city’s skyline, creating the ambience of a holy and peaceful city. Overnight at hotel. After breakfast transfer to the airport to board your flight for Srinagar. Srinagar is located in the heart of the Kashmir Valley at an altitude of 1,730m above sea level, spread on both sides of the river Jhelum. The present city of Srinagar was founded by Pravarasena-II, and Hiuen Tsang, who visited Kashmir in 631 AD.On arrival transfer to Houseboat. In the afternoon visit the Mogol Garden. Overnight on board. After breakfast sightseeing of Srinagar will be provided. The Dal and Nagin Lakes enhance its picturesque setting, while the changing play of the seasons and the salubrious climate ensures that the city is equally attractive to visitors around the year. In Kalhana, the author of ‘Rajtarangini’, states that Srinagri was founded by Emperor Ashoka (3rd Century BC). The present city of Srinagar was founded by Pravarasena-II, and Hiuen Tsang, who visited Kashmir in 631 AD. Laltaditya Muktapida was the most illustrious ruler of Kashmir in the Hindu period, which ended in 1339 AD. King Zain-ul-Abidin (1420-70 AD), popularly known as ‘Budshah’, was a great patron of Sanskrit. Akbar captured Kashmir Valley for the Mughals, who endowed Srinagar with beautiful mosques and gardens. The Sikhs overthrew the last Muslim ruler in the reign of Maharaja Ranjit Singh in 1819. Afternoon Shikara Ride will be provided. Overnight on board. After breakfast take an excursion to Pahalgam. Pahalgham – Unspoiled by the ravages of progress, 96kms east of Srinagar, nestled on the banks of the river Lidder lies the quaint village of Pahalgham. This is a serious angler’s delight where even amateurs manage a fair catch of rainbow trout from the rushing streams filled with bustling schools of fish. The large brown bear is a natural inhabitant of the thick pine and fir forests that cover the mountainside. Pahalgham has a golf course at 2400 metres above sea level and is well equipped as a base for trekkers. Camping equipment, ponies and porters are readily available. Kolahoi glacier is the popular destination via Aru, a charming meadow. Pilgrims bound for Amarnath stop at Pahalgham, their first point of worship. Later drive back to Srinagar. On arrival transfer to Houseboat. Overnight on board. After breakfast embark on a day tour excursion to Yusmarg. Yusmarg is a small meadow set in the heart of the mountains to the south-west of Srinagar. It is an ideal picnic spot and the Nilnag Lake can be visited from here. A two hour drive from Srinagar (47kms) will take you to acres upon acres of grassy meadow ringed by forests of pine, and towering beyond them, awesome and majestic snow clad mountains. Overnight on board. Day free for you to explore as you wish. (No transport envisaged) Overnight on board. After breakfast transfer to the airport to board the flight for Leh. On arrival transfer to hotel. Rest of your day is at leisure. Overnight at hotel. Full day spent witnessing the Thag Thog or Thak Thak festivals. The word Dak Thok means “Black Rock” in Ladakhi. It is a cave chapel which is a part of the Dak Thok monastery. The members of this Buddhist sect are followers of Padma Sambhava or Guru Rimpoche and the Tsechu Festival celebrates Guru Rimpoche’s deeds. The Tsechu Festivals are celebrated by cham dances where both the monks and the local people dance. The dances depict different aspects of the wrathful and compassionate deities and a variety of animals. This festival is one of the most interesting attractions in Ladakh. The spectators who are watching it bestow merit on them and instruct them in the teachings and even protect them from the evil things. Tsechu is also treated as a social gathering where the local people adorn themselves in the best of clothes and jewellery. Overnight at hotel. After breakfast transfer to the airport to board the flight for Delhi. On arrival transfer to hotel. Transfer to the international airport to board the flight for your onward destination in the early hours of 09th Aug’14. –	Double/twin bedded room in 3-4 star accommodations. –	Half board basis at all places except first night in Delhi where, as in Srinagar & Leh, the stay is on full board basis. –	Entrance Fees as per programme. –	Shikara Ride in Srinagar. –	Delhi – Amritsar by Shatabdi express Train in A/C Chair Car Class. –	Anything not mentioned in the above inclusions.